I am back from the weekend at the lakes in Minnesota and it was GLORIOUS! The weather was amazing. I soaked up lots of sun, did some pre-craft projects (more posts to come), and even went to the flea market where I scored some amazing finds! Prior to heading out, I whipped up this recipe and it was delicious. And, if you are following a gluten free diet or a cave-man type diet, I believe this will work for you! PS: I am down 20 pounds and 3 inches in my waist, so eating better and exercising is working for me! First up, if you do not like spinach it is OK...you can always scrape it out before eating, but honestly you really can't taste the typical spinach flavor...it was super yummy! Supplies needed for spinach stuffed chicken include: Olive oil, a couple cloves of garlic (I used the garlic chopped up in the jar and used two teaspoons), frozen spinach (thawed and drained with very little moisture remaining), chicken breasts (I used five), salt, pepper, poultry seasoning, and 1/4 cup of dry white wine. 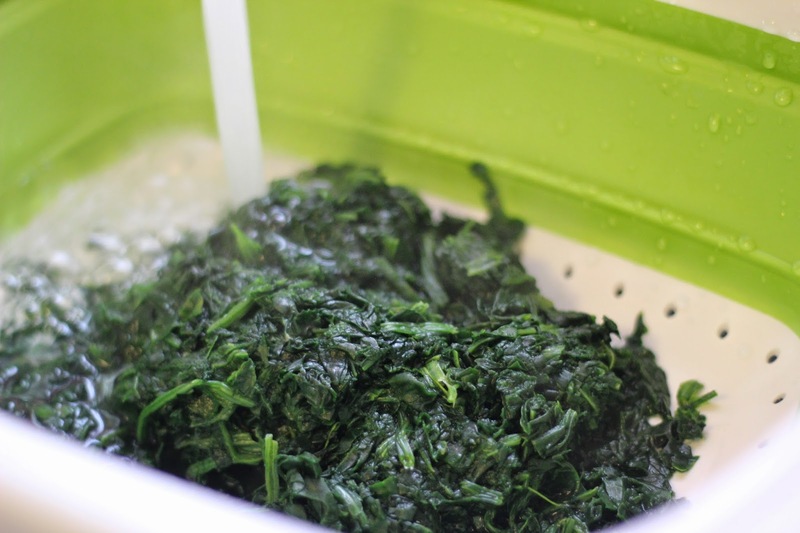 First up, thaw your spinach. Rinse and drain. 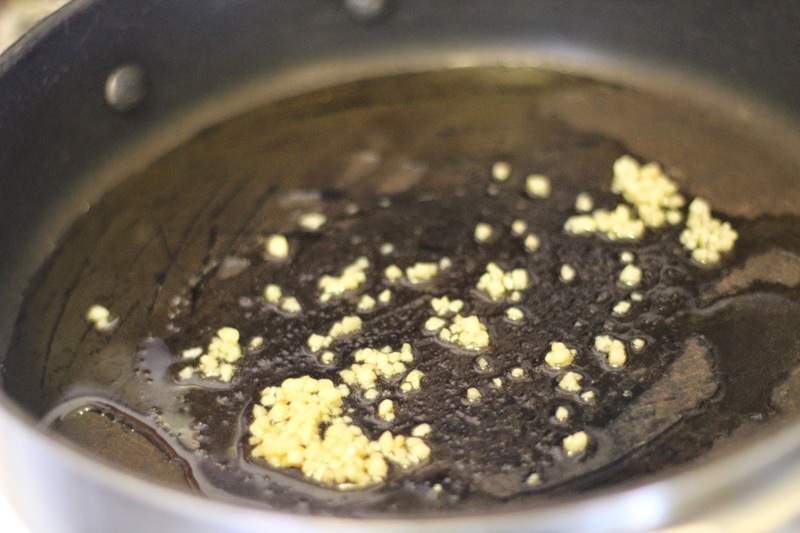 In a hot pan, add two tablespoons of olive oil and your garlic. Fry for a few minutes. 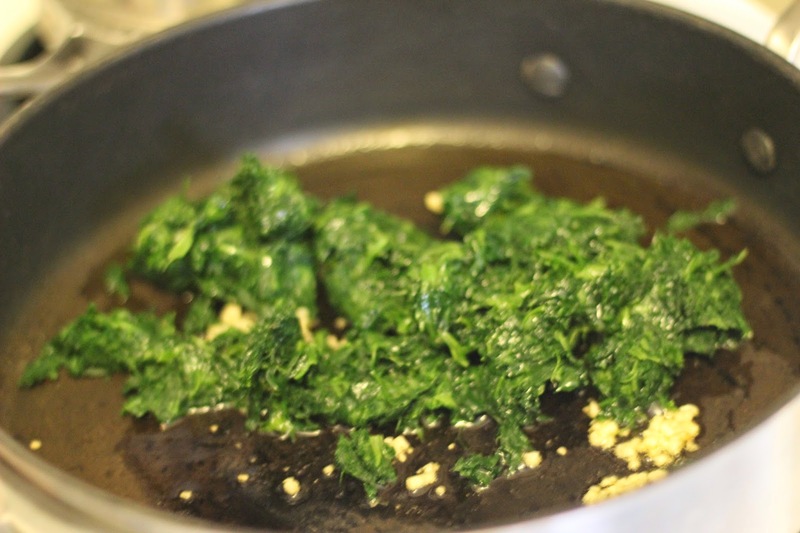 Add your spinach and cook for three more minutes. Then pull off heat and set aside. 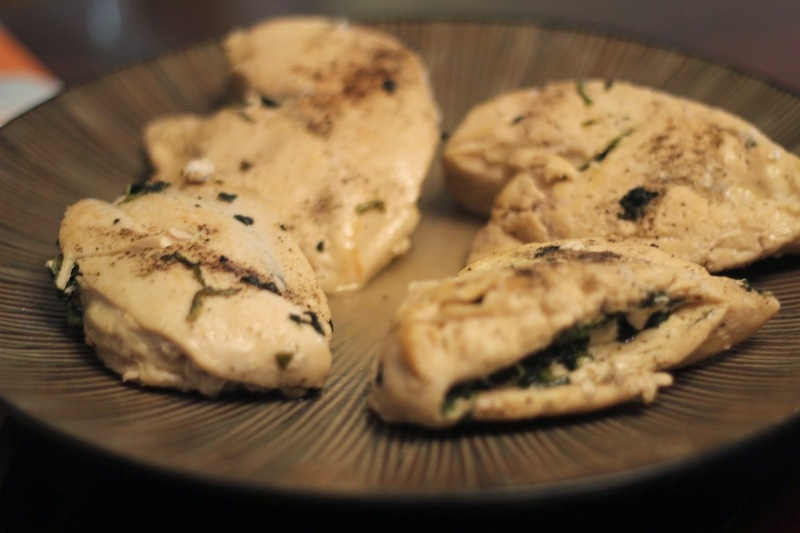 Slice your chicken breasts like a book leaving one side connected. Stuff them with the filling (I used it ALL UP). You could use toothpicks and roll the chicken, but I didn't find this step necessary. Season with salt, pepper, and poultry seasoning. Fry on each side until golden brown (around 7 minutes total). 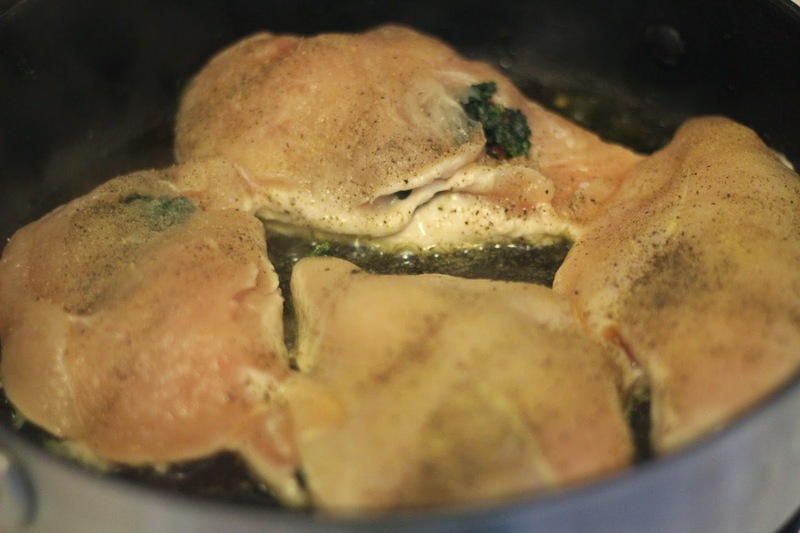 Add 1/4 cup of white wine to the pan, cover, and simmer for 10 more minutes. Remove the chicken. 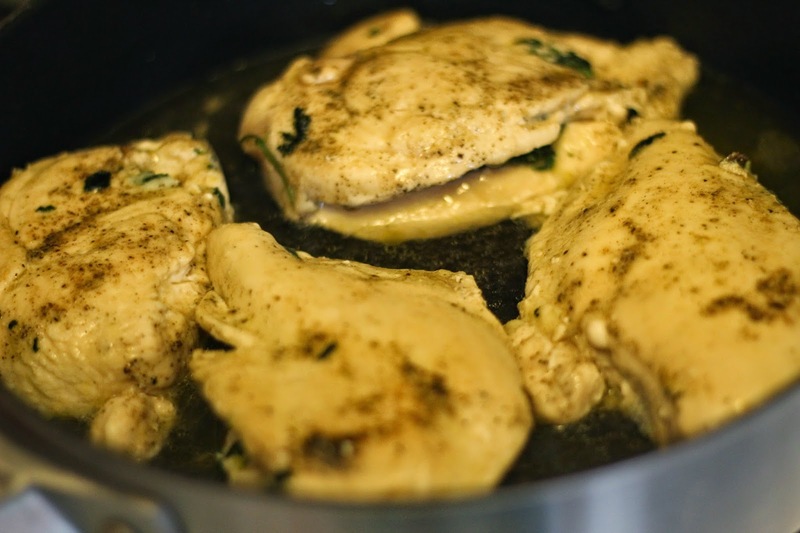 You can also continue to cook the drippings for a few more minutes creating a wine chicken gravy. Poor over the chicken. 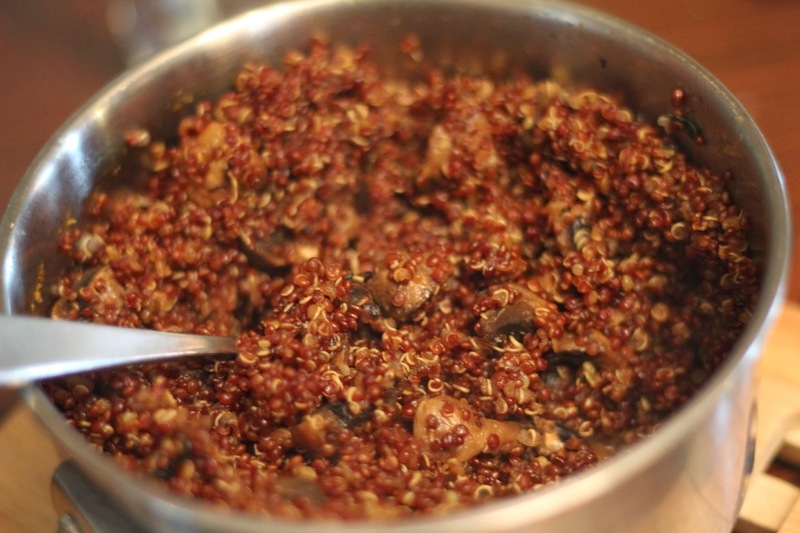 I also made quinoa for my side. I promise to show my recipe in an upcoming post. It is delicious and super healthy! Mur-Man gobbled the chicken down. The best part about the chicken is that it isn't dry. I believe the key to good chicken is moisture. Last night I made paleo chick fil a nuggets (knock-off) and homemade ranch. SO HEALTHY TOO. And delicious. (Thanks Ethne for the recommendation). 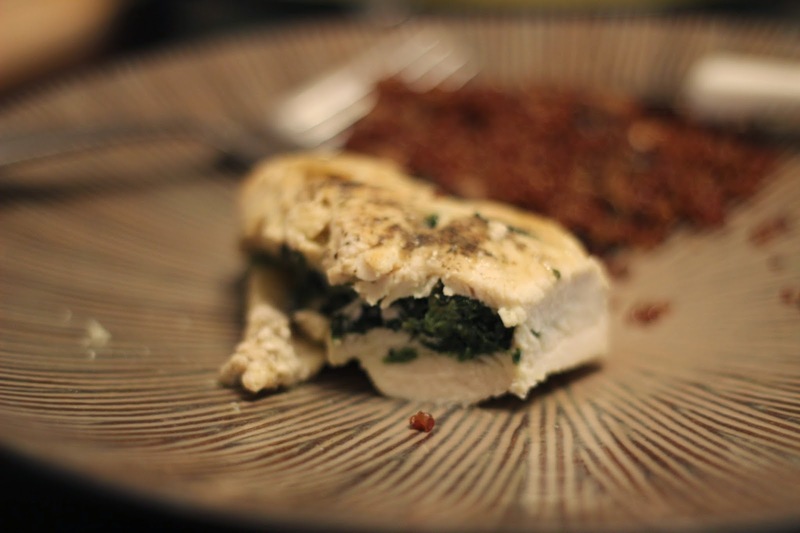 I haven't jumped on the paleo band-wagon yet, but SO FAR these meals have been delicious! Crafty G-Ma and G-Pa (my folks) are headed to town. Mom and I are going to Antique Roadshow in Bismarck, ND on Saturday...I will update you on that next week! ALL WHITE BATHROOM TOWEL UPGRADE!